More Double Denim at Palihouse! 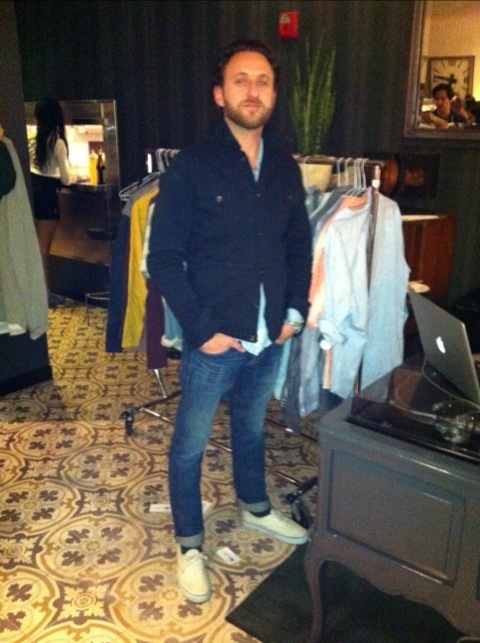 Lucky me met Lucky Brand’s VP of Merchandising Joshua Weiner in a major Canadian Tuxedo last night at Palihouse. Joshua was representing his brand well in the soon-to-be-launched Riviera Club X Lucky Brand jeans, Lucky Brand shirt and Robert Geller jacket. Loving all the Lucky looks and was super fortunate to have been included in a Lucky Brands shoot for Champagne and Heels earlier this year. This entry was posted on Friday, March 23rd, 2012 at 12:18 pm	and tagged with Canadian Tuxedo, Champagne and Heels, Denim, Denim on Denim, double denim, Fashion, Gretchen Schneider, Hellin Kay, Joshua Weiner, Los Angeles, Lucky Brand, Palihouse, Riviera Club X, Riviera Club X Lucky Brand, Robert Geller, Tiny Bandit, treadsocial, West Hollywood and posted in Fashion, In The Wild. You can follow any responses to this entry through the RSS 2.0 feed.